I was in São Paulo a little over a year ago and before going there I had no idea what to expect; though I assumed it would be all rainforests and tucans and voluptuous mocha skin women drinking from coconuts on desolate beaches; I mean, thats just naturally what Brazil evokes, right? Well, there was all that stuff but you had to drive a few hours to it; the city of São Paulo is actually a metropolis not all that much different than NYC. It's massive. The buildings go on for miles and miles; further than your eyes can see. São Paulo overwhelms the senses with its sheer size; with just over 11 million inhabitants, it is the world's 3rd largest city and the largest in South America. São Paulo ain't no sleepy tropical beach town, mofo. I was dead wrong. 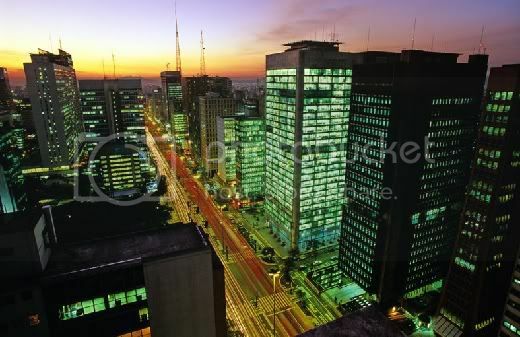 São Paulo is also known for its smog, the sheer size of its helicopter fleet, unreliable weather, and multitude of skyscrapers, holding the 7th position in the skyline ranking. So now picture this sprawling city, picture Los Angeles basically, with NO advertisements anywhere. No Posters. No flyers. No ads on buses. No ads on trains. NOTHING. It sounds like an Adbusters editorial: an activist's dream, right? Well in São Paulo, the dream has become a reality. In September last year, the city's populist right-wing mayor, Gilberto Kassab, passed the so-called "Clean City" laws. Fed up with the "visual pollution" caused by the city's 8,000 billboard sites, many of them erected illegally, Kassab proposed a law banning ALL outdoor advertising.